It simply wouldn’t be mid-March if I weren’t blogging about Julius Caesar. 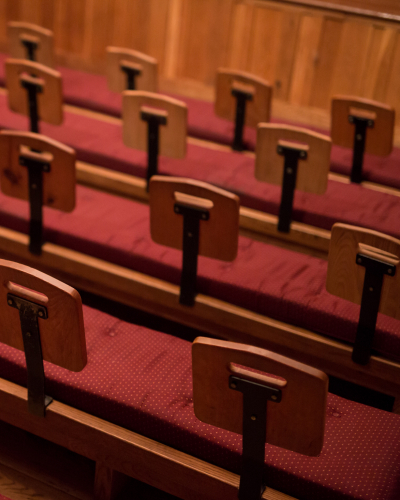 In past years, I’ve discussed the rhetoric, the blood, and the enduring legacy. Today, I want to talk about how one scene in the play — Caesar’s assassination — exemplifies Shakespeare’s mastery of early modern technology. 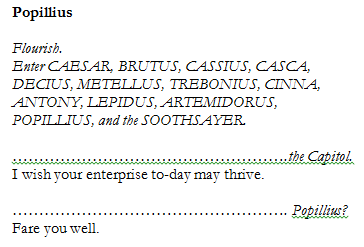 In the past couple of years, 3.1 of Julius Caesar has become my favorite scene to work through with cue scripts — scripts where an actor has only her own lines, plus the few words immediate preceding as a cue, rather than a full text. At first glance, I would guess most people could not imagine why. To be honest, I had my doubts when I first decided to dive into it as an experiment. The scene looks like a nightmare. Twelve speaking parts and two non-speaking roles make for rather a crowded stage (or classroom). Some of the characters speak at length; others hardly speak at all. Entrances and exits are muddied and uncertain. And somehow you have to organize everyone so that several of the characters can stab Caesar and bathe their hands in his blood. Who in her right mind would look at that and decide it’s the perfect introduction to cue scripts? I first worked this scene with high school students in Kansas, and since then I’ve used it in workshops at the Blackfriars Playhouse, at local Virginia schools, with teachers in our seminars, and with professionals in our leadership programs. Every time, I re-discover just how good Shakespeare is at what he does. That’s it, for the entire scene. Looks simple enough, right? But there are hidden challenges. Popillius is talking to Cassius, but sometimes, depending on how students arrange the entrance, he’s nowhere near Cassius at this time. Students generally have no trouble figuring out that, no, Popillius really shouldn’t be shouting that remark over the crowd (and over Caesar’s head), so then we have to go back and figure out how to get Popillius close to Cassius. Does he enter near him? Is there a time when he can cross the stage? There’s no right answer, so it’s a moment for discussion and negotiation. Then, we find out that Brutus can’t be near enough to hear what he says to Cassius, since immediately afterwards, he asks “What says Popillius Lena?” Sometimes this requires another adjustment to where everyone’s standing and moving. 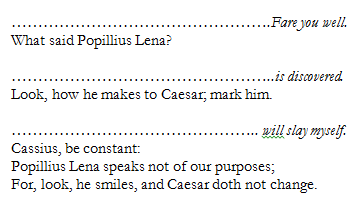 We find out not only that Popillius does not leave the stage, but that he goes to Caesar, and that he’s smiling. None of these clues are in Popillius’s script, so that actor has to be paying careful attention during rehearsal in order to adjust accordingly. This then brings up other questions later on — does Popillius stay on-stage during the assassination? If so, how does he react? If not, when can he leave? Some groups decide to have him wander off with Trebonius and Antony, just to get him out of the way. Others decide to let him stay and react — either in admiration and approval of the conspirators, if he really knew what “the enterprise” was, or in shock and horror, if he was talking about something else. The ambiguity opens up a lot of room for exploration — all in a character who only has two lines in the entire play. Popillius is just one example, but the scene provides us with many others. Trebonius’s cue script has two entrances without an exit. Publius has a line but no entrance. Antony has no lines, yet has to listen for several embedded stage directions. The Soothsayer and Artemidorus only speak at the top of the scene and have no exit line — what do we do with them? Send them off, or let them also observe as witnesses? And then there are all the beautiful embedded directions that lead the conspirators to surround Caesar before they kill him. Casca has to be the first to stab, and students generally figure out from Caesar’s famous line that Brutus is the last, but in what order do the others perform their lethal punctures? It looks like chaos — yet it always works out. Students of all ages figure out how to negotiate the demands of the scene with the space available to them. As a result, they not only enjoy the scene, find out that they can understand it perfectly well, and learn a little about blocking, they also see how good Shakespeare is at using the tools available to him. They can easily imagine the Chamberlain’s Men doing just as they did, working through a complex scene bit by bit, listening carefully to each other for clues, until it all comes together. That’s why I’ve come to love exploring this scene in workshops: it showcases not just Shakespeare’s verbal genius, but his technical aptitude and wonderful stagecraft.